Based on the recipe from Nigella Lawson's How to be a Domestic Goddess. The brownies came out perfectly, despite my misgivings that 125g of cream cheese was far too much. As I regularly make blondies, with a recipe that requires self-raising flour, I found these rather flat and disappointing, although I knew that was exactly what they were meant to look like. I commited the cardinal sin - mainly out of laziness - of melting my butter and chocolate directly in the pan over a low heat. I would never do this if I was melting chocolate alone, but I felt the fatty buffer of the butter(!) would protect the chocolate adequately. The brownies tasted good, I managed to make 30 tiny bite sized pieces out of them, even despite surrendering what I felt would have made at least half of my bites to the baking paper. Perhaps I shouldn't also grease the baking paper. 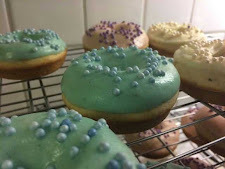 I probably wouldn't bother making this again; to be honest, I only did them to use the cream cheese left over from the Multi-Coloured Velvet Cake debacle (see earlier post), as dear friends who know me, also know that I don't like to waste anything!